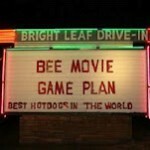 I’m sure there are many young people today that have no idea what a drive in theater is. The idea of sitting in a car with a speaker hooked to the window and kids in their pajamas watching a movie through the windshield probably sounds funny to them in their high tech world. 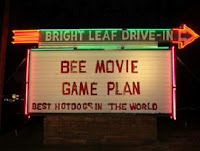 But if you’re in Mount Airy this summer, you can experience the drive in theater for the first time or all over again at the Bright Leaf Drive In on Rt 52 (Andy Griffith Highway). This drive in has been in operation since 1955 and the current owners are brimming with enthusiasm as they continue to make improvements. The drive in may be dead in other parts of the country, but here in Mayberry, there’s a double feature every night! We hope you get a chance to enjoy this icon of American Cinema soon and don’t forget to visit the snack bar!